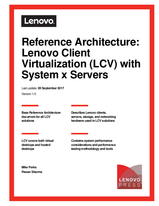 This document is the reference architecture (RA) for the Lenovo Client Virtualization (LCV) solution using System x servers and forms the basis for vendor specific reference architecture documents. This RA describes the business case and requirements for client virtualization and describes an abstract model for implementing client virtualization. Concrete instantiations of the model are provided in vendor specific RAs. This RA also describes the Lenovo and OEM hardware that can be used to implement the Lenovo Client Virtualization solution. Withdrawn: This reference architecture is now withdrawn. The replacement is Reference Architecture: Lenovo Client Virtualization (LCV) with ThinkSystem Servers.